Our average individual piglet birth weight is 3.6 pounds, higher than the industry average of 3.2 lbs. These bigger piglets produce larger profits when it’s time to send them to market. Light weight piglets resulted in higher mortality rates, reduced meat quality, lower average daily gain and lower lean gain. They also have poorer feed conversion when taken to suitable market weight. This industry leading birth weight allows Babcock Genetics to offer producers the#1 Market Hog in the industry. We have compared our numbers to those reported by the industry's top benchmarking data (MetaFarms) and consistently rank as #1. One of our customers in central Iowa has achieved an average daily gain of 2.17 lb., 2.22% mortality and 2.17% in lights and culls, feeder to finish, over the last 5 years. Our entire customer base averages 2.05 lbs. in Average Daily Gain and 2.26% mortality, with 66% fewer lights and culls compared to our competitors, feeder to finish. Profits in the swine industry have been slim for the past 10 years. Death loss in the finisher and cull market hogs reduce profitability even more. Babcock's research emphasizes the effect that litter size has on variation in birth-weight, survivability, and top value market hogs, rather than a single trait such as born alive. 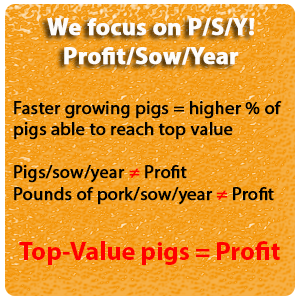 It may take the profits from 10 top value market hogs to make up for the financial losses of a single dead, cull or light weight market hog. P/S/Y has long been a measure of the productivity of swine herds. It is an estimate of sow productivity but not of facility utilization: for example, pigs per crate per year. It does not yield any information on the growing pig, revenues, or profits of the enterprise. Actually, recent research shows that P/S/Y has a negative impact on finishing performance and perhaps P/S/Y* (profit/ sow/ year) should be the measure of productivity.